For the last several weeks, 15 students and I have been focusing on Federation Festival which is coming up next weekend. Students have been finalizing memorization and doing some last minute polishing of their pieces. We’ve reviewed what they’ll do when they walk into the room with the judge and talked about what to do if they have a memory slip (forgetting a few measures of their music). Duets have been rehearsed, counting has been practiced, and everything is coming together. Now it’s time to send them out to do their best! This year, to assist with memorization, students assembled a puzzle of their pieces. I cut up copies of their music, sent them home with a zipper bag filled with the pieces, and they returned it glued together on construction paper. 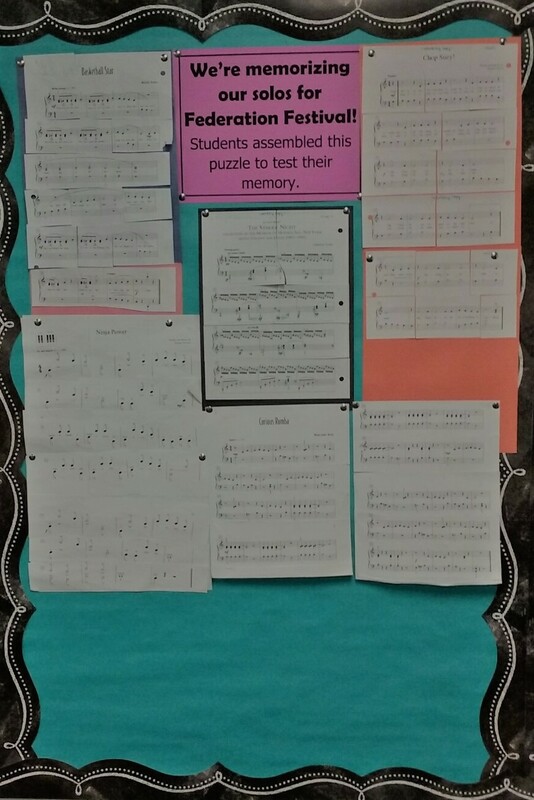 Many of the students told me it helped them keep the sections of their music organized in their mind. Awesome! Participating in a big event like Federation Festival helps us grow in many different ways, including giving us the opportunity to learn about more aspects of music!